The rate of “gray divorce”–couples aged 50 and older choosing to end their marriages–has just about doubled in the last 25 years. The reasons for this sharp increase are many, but certainly include the fact that divorce is no longer a social stigma as it was even a couple generations ago. No matter when a divorce happens or which party initiates the proceeding, it can be an incredibly stressful time full of challenges and obstacles. 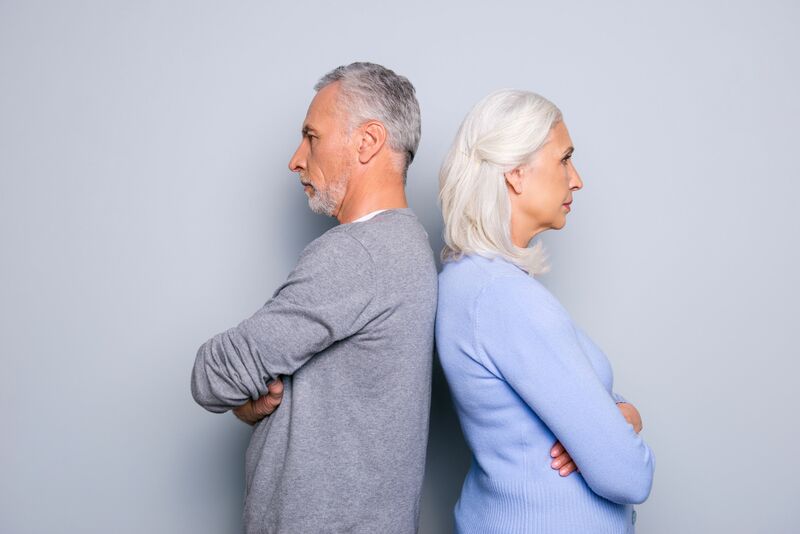 Sure, older couples likely won’t have to deal with child custody issues, but unfortunately, going through a divorce at a more advanced age doesn’t shield soon-to-be exes from many of the other concerns also experienced by their younger divorcing counterparts. Here are seven issues likely to arise if you are going through a divorce after decades of marriage along with tips on how you can handle them before they become bigger problems than they have to be. Homestead. Most couples who have been married for a long time established a primary residence many years ago. One of the fundamental questions, then, is what will happen to this house. Will one of you live in it? Where will the other spouse live? Will it be sold, and if so, how will you divide proceeds? And what about equity in the home? Make sure you have all of the relevant documents handy for when you meet with a professional to discuss how to handle your family homestead. Money. Ending a marriage inevitably involves some discussion of finances, and usually the longer the marriage, the more issues. Along with basic divorce financial considerations such as alimony and/or spousal support, you’ll also need to closely consider pensions, Social Security, health insurance and others. Again, having your paperwork handy is a great way to get a head start on these potential pitfalls. Also, depending on the dynamics of your relationship, discussing these issues with your spouse could smooth the way for an amicable settlement. Plans for caregiving. When you were together, you probably assumed one of you would take care of the other as you got older, but now without your other half, that option likely won’t be available. Planning ahead for the possibility that you may need caregiving is a smart idea now before anything happens. Frank discussions with your spouse and extended family are in order. Powers of attorney. As long-term spouses, you probably have served as each other’s powers of attorney, including health care proxies. You should consider whether your soon-to-be ex is really the person you still want in charge of important decisions should you be incapable of making them yourself. In most cases, the answer is no, and you should get new documents in place as soon as possible, i.e., before you have use for them. Estate planning documents. Along with updating your powers of attorney, you will probably need to adjust provisions in your will, trusts, living will and any other estate planning documents. Children, grandchildren and other family members. You may have to consider provisions for any children with special needs, and in addition to that, your family circumstances may also require special attention to other family members, including grandchildren. Even though you aren’t a couple any more, chances are good you’d still like to jointly provide for the family members you do share; you may also want to plan for things like what family holidays and vacations will look like from now on. Other intangibles. At this point, you shouldn’t underestimate the change you will encounter no longer living with someone who has shared your home for decades. Being prepared psychologically and emotionally for this adjustment is critical for your well being following your divorce. The best way to be ready to handle the potential stumbling blocks in your divorce is to consult with professionals who can guide you through this emotionally trying process. We’re here to help. Contact Brett Hyde or call (321) 255-2332 to start the conversation.